"A healthy mind in a healthy body". 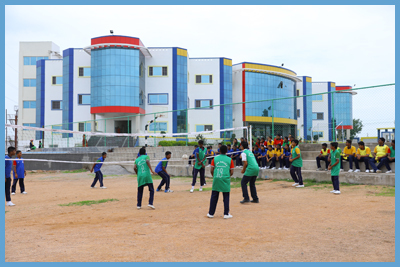 The school promotes and encourages a number of physical activities through sports and games which is an essential ingredient of the personality development of every scholar. 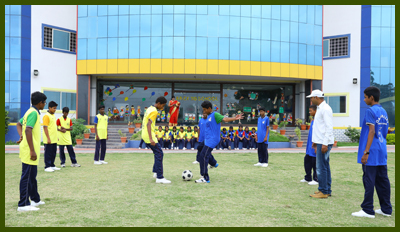 We believe that academics and sports are compatible and complementary in realising the child’s full potential. Activities in the playfield develops the qualities of teamwork, leadership, dedication, discipline, self confidence and self esteem. Sports equips scholars with skills that help shape their lifestyle and also strengthen them to face the challenges of an increasingly competitive world. The cornerstone of a sport curriculum is the recognition of every child’s right to sport. 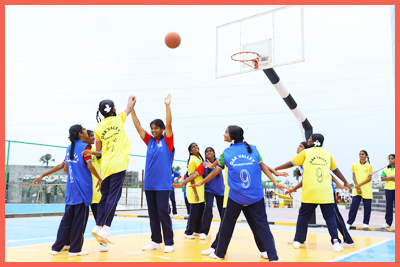 It is designed on the understanding that children have vastly varying physical abilities and hence require different types of sports and games. We offer world-class facilities in sports and games, and strive to meaningfully involve all the scholars in the use of this vast and varying infrastructure. A well-defined sports policy ensures a scholar’s smooth transition from childhood free play to competitive sports training. In the initial years children are encouraged to joyously participate in the mother sports of running, swimming and freehand gymnastics. Scholars in the junior school enjoy the ‘wings’ programme which focuses on developing gross motor skills and co-ordination while older scholars are encouraged to explore and display their special sporting talents. As they grow the school ensures that a scholar’s curriculum is upgraded in tandem. Special training regimes are individually developed by highly qualified and experienced instructors keeping in view the ability, talent and the potential of every child.